The core loop of a classic Free-to-Play game broken down to it’s purest form. 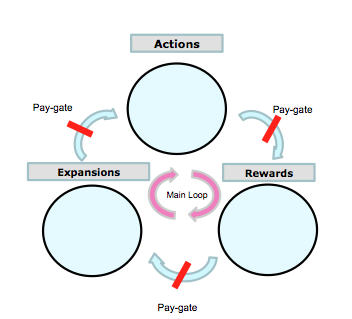 In the world of Free-to-Play many designers and Product Managers often talk about “Game Loops.” But what is a game loop, why is it useful to construct / design one and what benefits does it provide? In this post I’ll try and answer that question. When designing a mobile / Facebook Free-to-play game, session length is usually small, but repeated with regularity. Thus it’s really useful to think of the entire game experience as a loop, which should take approximately 5 minutes to complete. If the player enjoys the game, they can keep playing, but subsequent plays are effectively iterations of the core loop as opposed to a new experience. ACTIONS – Things the user can *DO* in the game, e.g. build a structure, harvest crops, tackle a puzzle, attack the enemy / other player. REWARDS – Given to the user as a result of successfully completing an action. E.g. 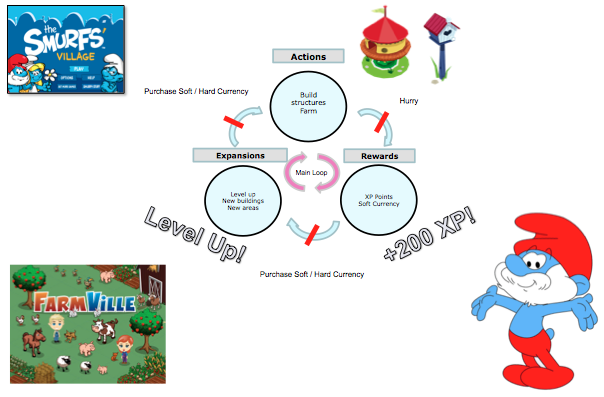 XP, Soft Currency, an item. EXPANSIONS – Available to the user after completing enough actions and acquiring enough rewards. E.g. land expansions, new items, new levels, new buildings, new troop types. A new player is guided through the loop within the first couple of minutes in both games, to quickly explain to the player how to play and progress in the game. The goal of core loop design is to create a quick, punchy experience that is FUN. A player should want to go through the loop over and over again, because it is fun. Initially to go through the loop, there should be very little friction, and a player should be able to expand quickly. However, as a player spends longer playing the game, the loop should be harder to complete and take more time. This is where you begin converting a player to a paid user. Friction should be introduced at each stage of the loop, ideally with impatience. A player should be able to Action, Reward and Expand for FREE. But impatience and friction should be used to halt progress and give the player a question to answer: Grind through the game or pay to play at a faster pace. In almost all successful F2P games, a player always has to pay to play. The question is if they pay with time (grinding) or with real money. Mobile Veteran previously of Capcom and GREE. Announcement – Joining Forces with the Best! Pokémon GO! – Fad or the Future?